DevTech has developed two early childhood technologies (children 4 to 7) that are widely available: the free downloadable ScratchJr programming app, and the scree-free KIBO robotics kit. ScratchJr was created in collaboration with Mitch Resnick from the MIT Media Lab and the Playful Innovation Company. KIBO is a robotic system that uses wooden programming blocks, rather than screens. Both projects were developed over 5 years of research and testing funded by the National Science Foundation. However, their sustainability and wide national and international impact are due, in the case of ScratchJr, to the generous funding the of the Scratch Foundation. 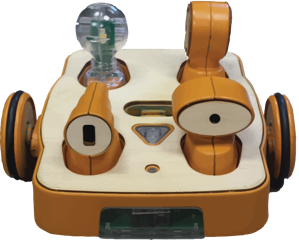 KIBO was commercialized by KinderLab Robotics, a company Bers co-founded in 2013 through NSF SBIR funding. Other technologies are being developed by DevTech and are in prototype stages.